F45 (short for Functional 45) is a wonderful way to get fit this summer and transform your body. 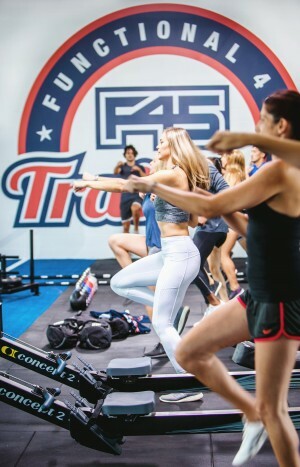 F45 is a group fitness training phenomenon from Australia and offers a wide range of unique themed classes which will both challenge and motivate you. Following its success in Australia, F45 is now set to take the UK fitness scene by storm. In addition to its flagship studio in Tottenham Court Road, there are almost 50 studios scheduled to open across the UK and Ireland during 2018. F45’s leading fitness experts have designed an extensive range of 30 unique cardio and resistance based, training programmes, that challenge you to mix up your weekly workout routine and reach your fitness goals. Each session is 45 minutes long and so fast-paced that it will burn up to 820 calories. Each session pushes you to your maximum, with constant support and guidance from the world- class F45 coaches. Sessions are carried out using the latest innovation in fitness-based technology to enhance your motivation and measurement. Screens are strategically placed overhead, illustrating each exercise, as well as a countdown to your rest period as you move along the circuit. Sessions are challenging yet fun, and never the same due to the infectious enthusiasm and dedication of the F45 coaches and the dynamic and supportive team environment. F45 programmes are specifically designed to provide a full-body workout whilst also improving your energy levels, metabolic rate, strength and endurance. You can choose from a variety of themed classes including “Romans Resistance”, which combines resistance and functional movement training to create toned, lean muscles and the “Hollywood” workout, which features 27 demanding stations of HIIT circuits to upbeat tunes from a live DJ. Classes are suitable for all regardless of age and fitness levels, enabling you to workout at your own pace as you challenge yourself and progress to reach you own goals. F45 are offering regular classes that also run through the summer. F45 enables you to feel the adrenaline rush of a high intensity workout to ensure you achieve fast, effective results. To find a studio near you visit www.f45training.co.uk.